Jamie Duffy | The Journal Gazette Pipes to fix a lift station, which carries wastewater to a sewer line, lay outside the Hoosier Inn. Residents say available water has been spotty for a week and a half. If the water issues are not fixed, the hotel could be shut down, city officials said Thursday. Toilets won't flush and the faucet is dry most of the day. 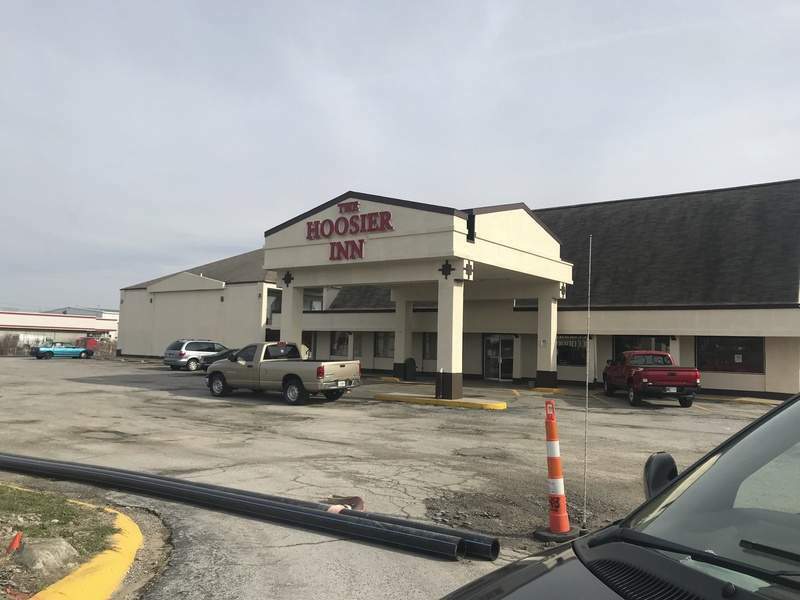 For two residents Thursday, that was enough for them to pack their belongings and move out of the Hoosier Inn at 3527 W. Coliseum Blvd., hoping for better services up the road. "I can't take a shower," the male resident said inside the room where empty plastic water bottles lined the sink. Water had been unavailable for about a week and a half, the couple said. The couple asked to not be named because they were unhappy and leaving and didn't want to cause problems with management. Water problems are being addressed at the hotel, local city officials said Thursday, and if the problems aren't fixed, the hotel could be shut down. A city official visited the hotel Thursday and "will be issuing a 7-day condemn and vacate notice, which means that if after seven days the issues are not resolved, the property will be condemned and residents would need to relocate," Mary Tyndall, city spokeswoman, said in an email. Megan Hubartt, spokeswoman for the Allen County Department of Health, said the owner was fixing a lift station that was scheduled to be back in use Saturday. "Lift stations are not used to bring water into a facility. It is a pump that is used to get wastewater out of a facility to the nearby sewer lines. The reason the hotel is limiting water use during the day is to keep excess wastewater from backing up during the repair and causing further issues. It’s a problem that could happen to any facility needing a lift station to get their wastewater to the nearest sewer line," Hubartt wrote in an email. The property owner, listed on a report sent by the Department of Health to The Journal Gazette, is Naresh Khatana, and he is making progress, Tyndall said. A new sewer line is being installed because the old line failed, Tyndall said. "Our officer has been told that water is always available in the lobby." According to the Health Department, water is available for three hours between 6 a.m. and 9 a.m. and 6 p.m. and 9 p.m.; however, residents interviewed said that had not been the case. At the front desk, Khatani was not available, but hotel employees handed out a printed message indicating that residents could use the restroom in the office outside of the three-hour water slots. "If you would like to shower outside those hours, than your (sic) more than welcome to go across the street to the Suburban," the note read. The owner rented two rooms at the Suburban Extended Stay Hotel, at 3330 W. Coliseum Blvd., the unidentified employee said. Since there are a number of wheelchair-bound residents, getting to the Suburban would be difficult, the couple added. Their rental at The Hoosier Inn is $200 a week, $40 more a week than the hotel where they were moving on North Coliseum Boulevard, they said. "They always have water there," the male resident said.